A few weeks ago I stumbled onto a website called Storybird. Storybird users can make books for free by selecting illustrations from the site's library, then writing accompanying stories - kind of a reversal of the usual process of writing. The artwork is provided by professional illustrators who license Storybird to use their art for this purpose. If an author purchases an electronic copy or paper copy of the book they've made, the illustrators featured in the book get a cut of the profits - according to Storybird, as much as 35%-50%. In theory Storybird is a good way to make a secondary income off of your artwork. The website doesn't purchase your artwork, like a stock site, it just licenses them, so you still own all the rights to your work. In this way, Storybird has a very pro-artist attitude. Storybird also requires artists to apply for a store, so the website as a certain level of quality control. Storybird is also a great way to grow your online fanbase, especially if you're a children's book illustrator. Your artwork will get seen on Storybird - according to the site, my artwork has already been viewed over 18,000 times and I've received a lot of really sweet comments from users. Not just "I like your art" but things like "I've been waiting for an artist that does magic in modern day times. I now have so much inspiration, because of you and your art." Storybird encourages you to link to your website and Etsy store in your profile so that you can make additional income off of prints, etc. It's fun to see what kinds of stories people will come up with when they see your artwork. At this point my artwork has been used in over 70 books - although many of them are not very developed, (they are, after all, written by kids and preteens) some of them are quite charming. My favorite so far is the Dragon Glass by GaladrielSkywalker. Storybird could be a good source of secondary income in theory - but right now I've made a total of $0.14 off of the site. True, I've only been on the website for about three weeks, and Storybird recommends having at least 40 illustrations in your gallery to get more users and views. (I only have 18 illustrations posted at the moment.) Considering that Storybird claims that artists earn royalties of 35%-50% on sales, it seems like one would have to accrue a very large quantity of sales to make much money at all, or get lucky and have a lot of authors purchase pricey hardback copies of their books. Currently, authors are the only ones who can purchase copies of the books they write, not other users of the site. This really limits the amount of possible royalties for artists. Someone could write an amazing book using your artwork - but at most that book can only be purchased by them, not by you or anyone else. Storybird claims that they are "exploring a publishing program where we sell popular stories from member authors," so this could change in the future. The artist dashboard is severely lacking in information - there is no way to find who has used your art in their books other than just browsing through the site, or by emailing Storybird and asking them. Since seeing books inspired by your art is part of the site's appeal, it's frustrating that it's not easier to find this information. Additionally, the dashboard doesn't list where your royalties have come from, or when you earned them. They just mysteriously appear. In conclusion, I think Storybird is an interesting system with some promising possibilities. At the moment it's not going to be much of a money maker for illustrators unless they have a very large back catalog of work they can post online. (And with the popularity of work-for-hire contracts these days, it's kind of difficult to have that much available artwork.) However, the staff at Storybird is very communicative and open to suggestions, and they are continually developing the site. If you're interested in Storybird, Publishing Perspectives wrote an interesting article on them last year. Otherwise, why not browse around the site? I think illustrators should take a look at it. Definitely worth taking a look. I linked to your blog post in this week's Friday Five. Seems cool.... How does the site handle rights of images? Can you elaborate on what you mean, Alex? That is a certainly brilliant application. The internet really produces lots of ways, in which we can generate our products quickly. In my opinion, that is something we should take advantage of when we're expanding our literary ventures from mere hobby. Good luck! Thank you for writing this, Kelley! 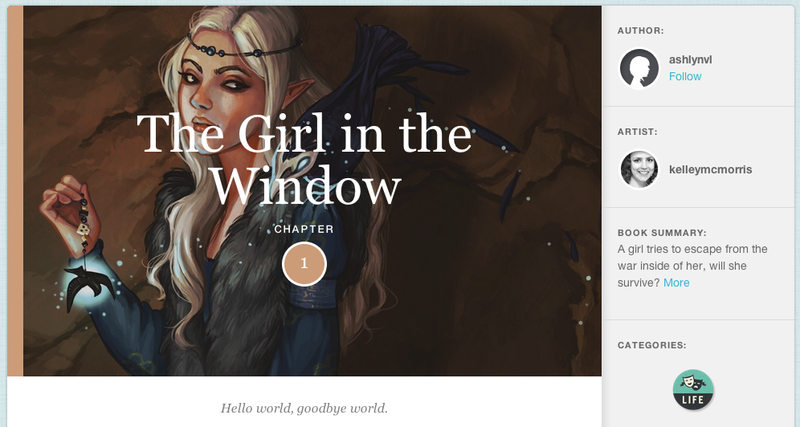 I just joined Storybird myself and have been similarly flummoxed by the dashboard. Their FAQs on income are also pretty vague.